Fall 2016: After completing narration on Zane Grey’s timeless classic “Riders of the Purple Sage” around the Christmas holiday, I was pleased when Carlyn Craig, owner of PostHypnotic Press audiobook publishing, phoned and said she was excited to nominate my performance for a Voice Arts Award. The audiobook industry doesn’t have many awards, and so this was thrilling to me. 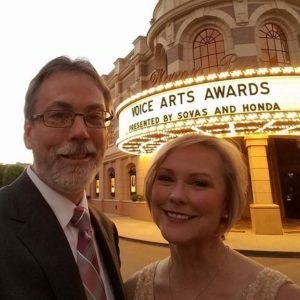 The Voice Arts Awards event is a relatively new award ceremony for the voiceover industry. The organizing entity, the Society of Voice Arts and Sciences (SOVAS) has worked hard to execute a Hollywood-style ceremony, with all the glitz and glamour of the Academy Awards. While there are still some glitches for founders Rudy Gaskin and Joan Baker to iron out, great strides are being made toward establishing this event as a legitimate, respected annual event of recognizing the best of the best in the voiceover industry. While I did not win this year, I was incredibly humbled and honored to have been nominated and I relished the whole process, from booking flights and hotels to gown-shopping. My husband accompanied me, and I could not have been happier to have him by my side. Collaborations with publishers on ever higher-quality audiobook projects are increasing, and I hope to achieve a nomination again some day!